Silke Otto-Knapp, Seascape (Islands), 2016. Watercolor on canvas, 150 x 130 cm. Photos: Marcus Leith. Courtesy of greengrassi, London. 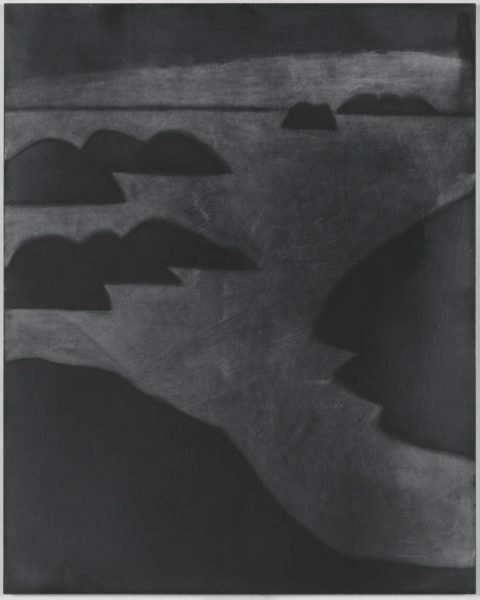 Silke Otto-Knapp, Rehearsal (Seascape with moon), 2016. Watercolor on canvas, 150 x 170 cm. Photos: Marcus Leith. Courtesy of greengrassi, London. Silke Otto-Knapp, In the midnight hour, 2016. Watercolor on canvas, three panels, 180 x 480 cm (each panel: 180 x 160 cm. Photos: Marcus Leith. Courtesy of greengrassi, London. Silke Otto-Knapp, Stage I (YSL, fall/winter 1966; the heart, the sun, the moon), 2016. Watercolor on canvas, 100 x 130 cm. Photos: Marcus Leith. Courtesy of greengrassi, London. Silke Otto-Knapp, Stage II (YSL, fall/winter 1966; the heart, the sun, the moon), 2016. Watercolor on canvas, 100 x 130 cm. Photos: Marcus Leith. Courtesy of greengrassi, London. Silke Otto-Knapp, Portrait (YSL, fall/winter 1966; the face, the body, the first smoking), 2016. Watercolor on canvas, 80 x 60 cm. Photos: Marcus Leith. Courtesy of greengrassi, London. Silke Otto-Knapp, Rehearsal (Sky above clouds, 1965), 2016. Watercolor on canvas, 120 x 140 cm. Photos: Marcus Leith. Courtesy of greengrassi, London. Silke Otto-Knapp, Seascape (Sky), 2016. Watercolor on canvas, 100 x 80 cm. Photos: Marcus Leith. Courtesy of greengrassi, London. Silke Otto-Knapp, Stage (YSL, spring/summer 1988; Braque collection; doves, guitars), 2016. Watercolor on canvas, 130 x 160 cm. Photos: Marcus Leith. Courtesy of greengrassi, London. 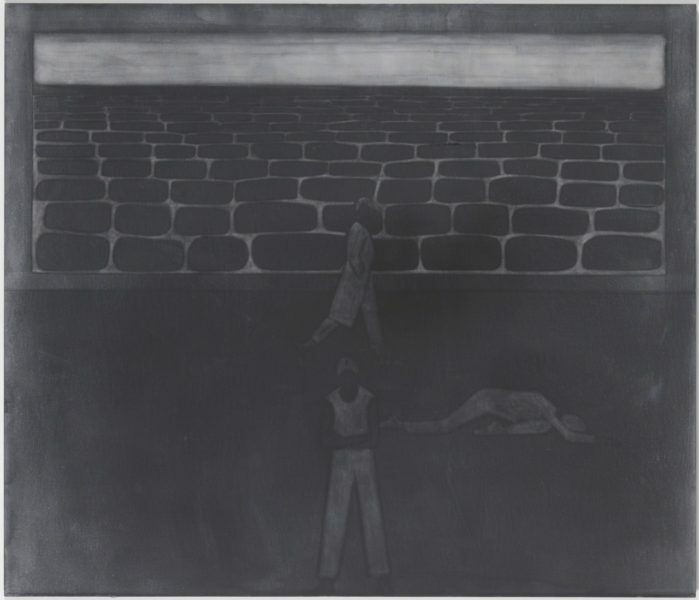 Silke Otto Knapp’s new show at greengrassi is composed through a compact palette of blacks and greys, creating a solemn atmosphere for her new paintings of landscapes and figures. Two years ago, Otto Knapp showed her other landscapes and theatre sets at Camden Arts Centre, and in the meantime she has been in a group show at the Hammer Museum in Los Angeles, the city where she moved to teach painting and drawing to the students of UCLA. The first painting you see as you enter the gallery is called Rehearsal (Seascape with Moon) and it suggests the atemporal dimension of certain dreams. 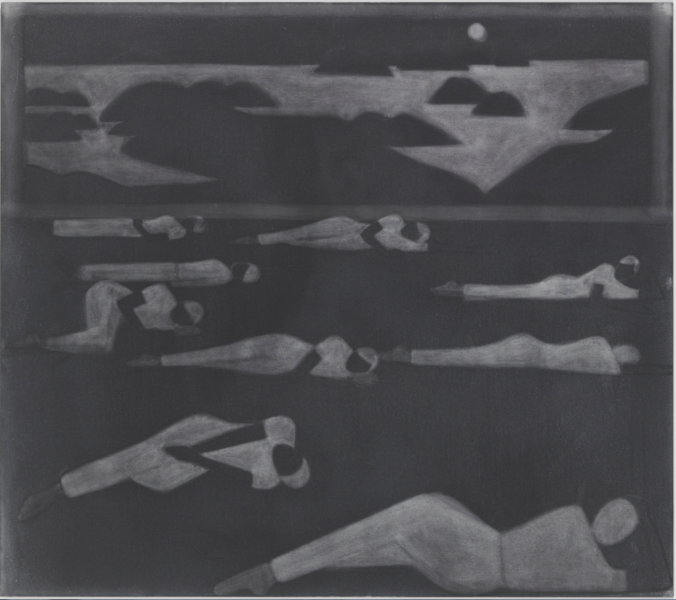 The figures are lying down in different poses below a moonlit sky, their luminous whiteness set against a dark background. We might wonder what has happened to them and guess at whether they drifted out to sea and found a moment’s rest. The ‘rehearsal’ of the title is as much a routine exercise before a performance, where the choreography is repeated towards an idea of perfection, and what we see is the dancers caught in a time that is suspended. 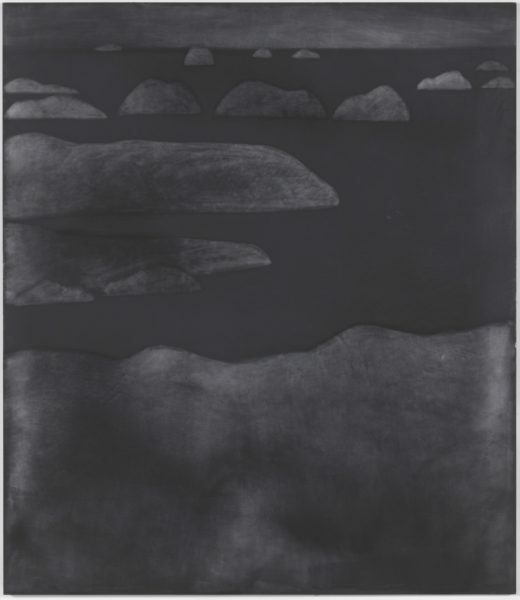 Rehearsal (Seascape with Moon) serves as an introduction to the next paintings, where the gaze moves from subject to subject, from tonality to tonality, where dream settings and figures merge through association rather than rationality. A large painting dominates the centre of the main room. It displays bodies in different positions that correspond to precise movements, like the instructions of a choreography. In the Midnight Hour depicts Yvonne Rainer’s dance piece Trio A, first performed in 1965, which deals with the repetition of a series of movements; echoing the sense of recurrence in Rehearsal (Seascape with Moon). What is achieved in subject matter is reinforced by Otto Knapp’s striking use of using black and white tones. 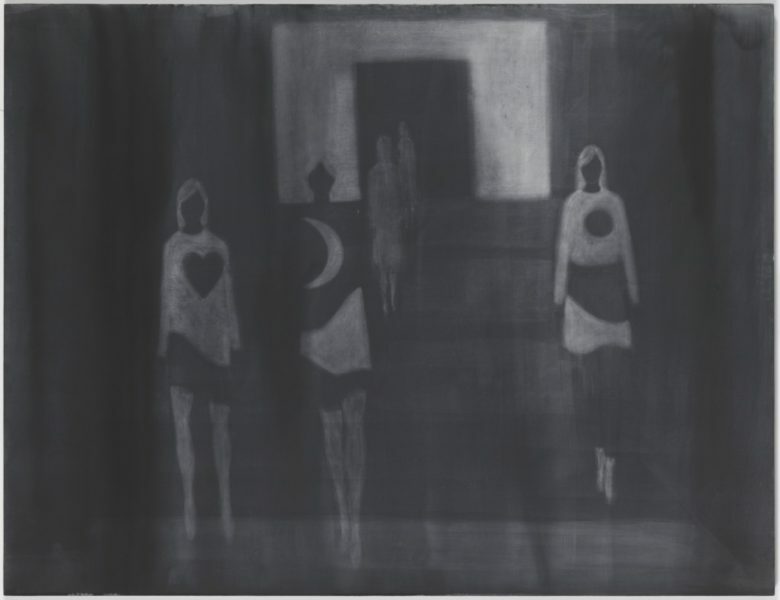 This use of black and white – the result of washing away paint from the canvas to let the underlying image emerge – resonates with art historical traditions such as chiaroscuro, the sepia ink drawings of the 19th century, Japanese wood blocks, or expressionist woodcuts. This method of subtraction explains much about the decisive contrasting effects within a canvas and the relation between foreground and background in her works. What does this say about the artist? It seems that her interests lie within process, one that engages with elements out of her control, and perhaps the contrasting grey palette enables a particular kind of ambiguity to articulate itself upon the canvases, one in which a form can be two different things simultaneously. 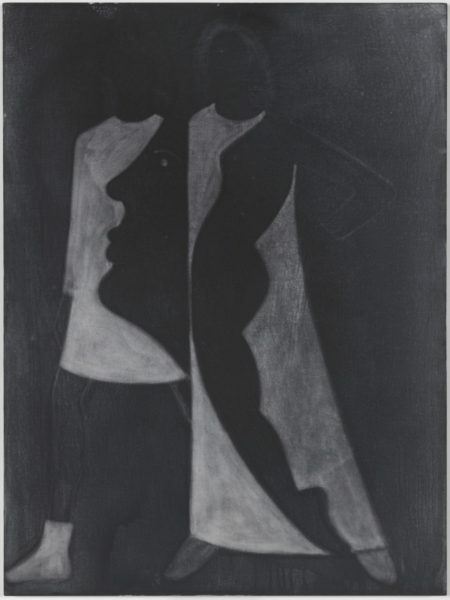 In Portrait we recognise the silhouette of a face and the form of a flexible body within the dresses of the two women. It is a portrait of models wearing a collection by Yves Saint Laurent but also a study of the body itself. The associations are multiple, the blacks and whites set a rhythm that is precise, compact and condensed, enabling a meditative approach to the works that interact with one another. 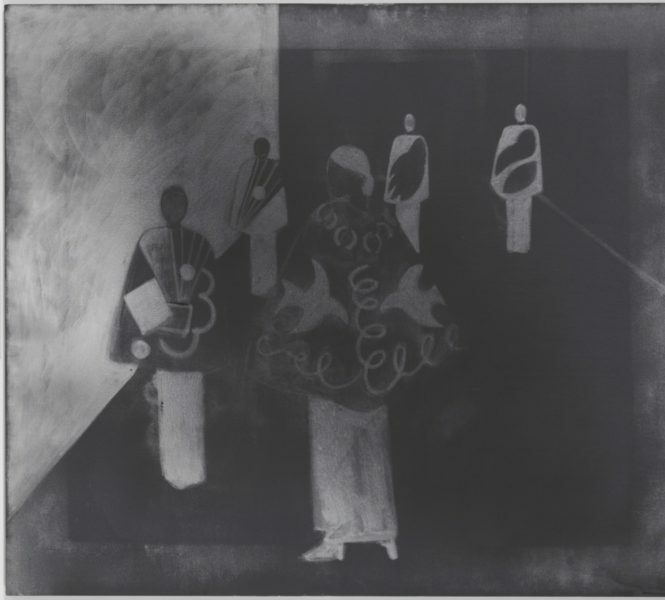 The space of the canvas is always controlled, like the proscenium of a theatre – in Rehearsal (Sky Above Clouds) but also in the elongated catwalks recognisable in Stage, where the capes evoke Japanese kimonos and Matisse ornamentations. And it is precisely what is left, the ornament, the painted motif or the aftermath of an event, like in the opening painting Seascapes or the half moon over the moon in Stage I, that contribute to such stages and spaces. 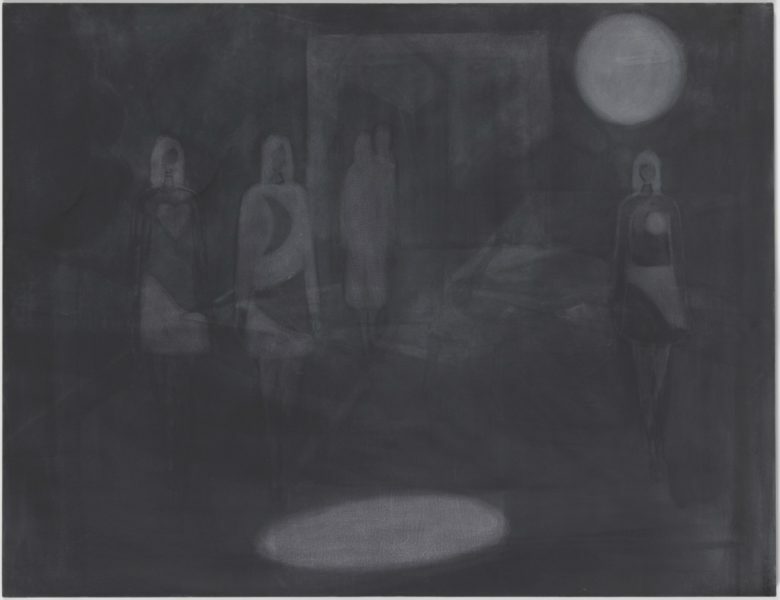 All show Silke Otto Knapp to be a painter of ambiguous, seductive atmospheres.